The Irish EU presidency is now under way, giving Ireland a high profile opportunity to restore its image and make progress on agriculture and the wider economy. Peter Cheney summarises Ireland’s priorities and how Northern Ireland is becoming invoved. Reforming the Common Agricultural Policy and stimulating the European economy are two major themes for Ireland as it holds the presidency of the Council of the European Union over the first half of 2013. Ireland is also marking the fortieth anniversary of its EU accession. The Council of the European Union is more commonly known as the ‘council of ministers’. It brings together the ministers of all 27 member states except for heads of government and heads of state, who meet as the European Council. Ministers meet in 10 different configurations, depending on the subject under discussion. The presidency rotates around member states with each one holding it for six months. Ireland’s seventh presidency started on 1 January and concludes on 30 June. It will not hold the presidency again until after 2020. 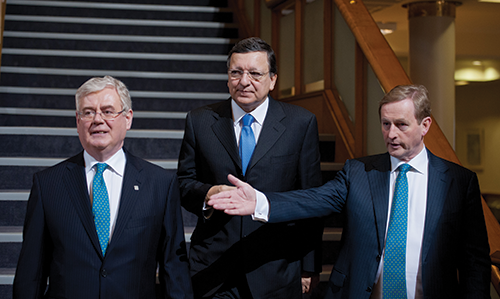 Ireland has set out three broad priorities: stability, jobs and growth. A stable Europe, in the Irish Government’s view, depends on speeding up the pace of integration between the 17 euro zone economies. This includes seeking agreement on the proposed euro zone banking union, including a ‘single supervisory mechanism’ for euro zone central banks. Ireland wants to involve national parliaments in the European semester: an annual process which produces economic policy recommendations for all member states. Other priorities include making progress on the financial transactions tax (opposed by the UK Government), continued discussions on the common consolidated corporate tax base and representing the EU in the G20 group of finance ministers and central bank governors. A Directive on freezing and confiscating criminal assets will also be taken forward. Ireland has strongly supported this legislation due to its own experience of cross-border organised crime. Job creation is linked to the single market and agreeing the Multi-annual Financial Framework: the EU’s overall budget for 2014-2020. Progress on legislation on cyber-security and data protection will help to create a ‘digital single market’. The Digital Agenda Assembly, a major international IT conference, takes place in Dublin on 19-20 June. The Competitiveness Council, in May, will focus on helping small and medium enterprises to drive European growth. The presidency will also seek to standardise accountancy rules for SMEs, speed up payments between countries, and improve value for money from state aid (government and EU grants to businesses). Ireland identifies cohesion funding for poorer regions, the Common Agricultural Policy (CAP) budget and the Horizon 2020 programme as three priorities for the renewed negotiations. Ireland will place a “very strong emphasis” on securing agreement on CAP reform and will emphasise the importance of a ‘food’ policy as opposed to an ‘environmental’ policy. As an island nation, Ireland is also focusing on ‘blue growth’. It wants to see an integrated maritime policy that would develop marine transport, renewable energy resources, fisheries, tourism and mineral extraction. Increased marine spatial planning will help to balance the interests of the sectors involved. The growth theme covers the economic situation but also refers to EU enlargement and the union’s increasing influence in foreign affairs. Croatia will become the EU’s twenty-eighth member state on 1 July 2013 and Croatian members are already attending Council meetings as observers. Ireland wants to complete trade agreements between the EU and Canada and Singapore, and to prepare the ground for a more ambitious EU-USA free trade agreement. Food security, conflict resolution and the Arab Spring will also be on the agenda. The presidency also covers several areas of social and environmental policy. Ministers will hold a roundtable discussion on tackling homelessness. The Commission will also be bringing forward a ‘social investment package’ which will cover child well-being and welfare. Decisions on social security policy must be passed unanimously in the Council. Negotiations will start on a new Tobacco Products Directive, to tighten the regulation of the substance. The proposed 7th Environment Action Programme will set out the EU’s environmental priorities over the next 10 years. The Commission is expected to publish a climate adaptation strategy in March and a high level conference on ‘climate justice’ for poorer countries will take place in April. Ireland hopes to agree a strategy on trans-European transport networks which would last up to 2050. Talks on implementing the single energy market will continue. Writing in agendaNi, Energy Commissioner Günther Oettinger has criticised national governments for slow progress (issue 56, pages 34-35) and ministers are due to make their response during the Irish presidency. A cultural programme is also accompanying the presidency and includes art, music and poetry to celebrate Ireland and its place in Europe. CAP reform has been the Northern Ireland Executive’s main priority in the preparations for the presidency. Agriculture Minister Michelle O’Neill will press for the CAP budget to be “maintained at the highest level” and a gradual transition toward area-based payments. O’Neill has established a common negotiating position with Irish Agriculture Minister Simon Coveney and will be invited to the relevant meetings during the presidency. The same offer has been made to other Executive ministers. David Ford attended a European Justice Council meeting in January, where he highlighted the province’s community safety strategy and policing and community safety partnerships. Ford also met Alan Shatter to discuss how to strengthen cross-border co-operation against organised crime. All the main parties view CAP reform as the main priority for Northern Ireland in the presidency. Arlene Foster is also lobbying for less bureaucracy in the EU’s Horizon 2020 programme for research and development.